PLEASE BE SURE TO WAIT FOR INVOICE BEFORE PAYING FOR ITEM. 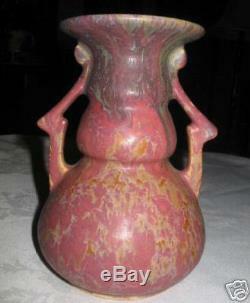 1915 CARNELIAN II, ART POTTERY VASES, IN ABSOLUTE "MINT CONDITION". NO CHIPS, CRACKS, HAIRLINES, OR REPAIRS!! YOU WILL BE QUITE PLEASED WITH THE "THICK" COTTON CANDY GRUEBY LIKE GLAZE AND SPECTACULAR "ARRAY" OF GLORIOUS RICH COLORS!! THESE ROSEVILLE CARNELIAN II ART POTTERY PIECES ARE HIGHLY COLLECTABLE AND ARE GETTING HARDER TO FIND!! THIS LOVELY VASE HAS A NICE ARTISTIC SHAPE TO IT WITH A LOVELY SQUATTY BOTTOM AND FLARING ART DECO HANDLES!! IT MEASURES A WONDERFUL DISPLAY SIZE: 7 1/8 " HIGH, X 5 " WIDE ACROSS HANDLES, X 3 7/8 ACROSS TOP. IT DISPLAYS WITH TREMENDOUS NOSTALGIA AND ANTIQUE ART POTTERY CHARM!! I'M CERTAIN THAT YOU WILL BE QUITE PLEASED TO OWN AND DISPLAY IT!! IT IS AN INVESTMENT QUALITY EARLY PIECE OF ROSEVILLE ART POTTERY AND WILL CONTINUE TO APPRECIATE IN VALUE!! IT'S A REAL BEAUTY!! IT IS NEARLY 100 YEARS OLD! We do our best to describe each item completely and post clear images for your review..... Thank You for viewing and Have a Wonderful Day! The item "ANTIQUE AMERICAN ROSEVILLE CARNELIAN II ARTS CRAFTS FLOWER POTTERY VASE MISSION" is in sale since Wednesday, October 22, 2008. This item is in the category "Pottery & Glass\Pottery & China\Art Pottery\Roseville".